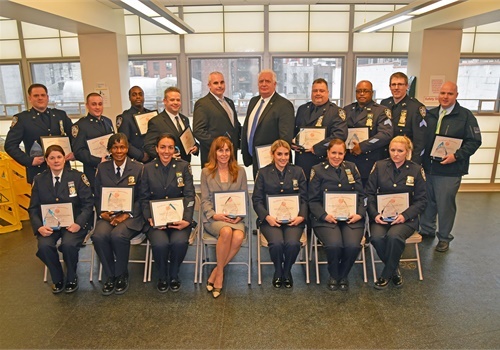 The ASPCA (The American Society for the Prevention of Cruelty to Animals) honored 16 members of the New York City Police Department (NYPD) and one Assistant District Attorney for their tireless efforts to help animals through the NYPD/ASPCA Partnership. The honorees attended a celebratory luncheon Tuesday held at the ASPCA's Adoption Center and were given appreciation awards for their critical roles in preventing, investigating, and prosecuting cases of animal cruelty and neglect in 2017. "The 17 men and women we're honoring today were champions this year for animals across New York City," said Howard Lawrence, Vice President of ASPCA Humane Law Enforcement. "They helped engage their colleagues and citizens in concrete ways to combat animal cruelty and were instrumental in building more actively engaged, safe, and humane communities." Deputy Chief Luongo is the Commanding Officer of the Special Investigations Division. This division is comprised of the Detective Bureau's elite investigative units, including the Animal Cruelty Investigation Squad (ACIS). Deputy Chief Luongo is being recognized for his commitment and dedication to the NYPD/ASPCA Partnership. Through his many duties and responsibilities, Deputy Chief Luongo has been an integral part of the growth and development of the program. He always finds time in his busy schedule to participate in trainings and other events where his presence has a great impact in ensuring that animal welfare is a priority with all members of the NYPD. His oversight of ACIS has resulted in an increased focus on animal fighting as well as other animal cruelty-related crimes in New York City. Deputy Chief Jones is being recognized for her commitment to improving police/community relations, community development and raising animal welfare awareness. Deputy Chief Jones was the lead facilitator for the Let's Paws for Earth Day event on Staten Island in April. She initiated this event to provide residents in Staten Island an opportunity to connect with police officers, social service agencies, city agencies, and various animal welfare groups. Attendees celebrated Earth Day with a DJ, the NYPD rock wall, the ASPCA adoption van and multiple give-a-ways. This event was innovative and combined the efforts of law enforcement, human service agencies and animal welfare organizations to provide support to residents in the borough. Deputy Inspector Kilfeather is the Commanding Officer of the Leadership Development Section, which provides quality leadership training for NYPD executives, lieutenants, sergeants and civilian supervisors, first upon achieving rank or title, and then continuing with in-service training programs. Deputy Inspector Kilfeather is being recognized for her dedication and commitment to ensuring that animal cruelty training is an integral part of the department's supervisory training. Due to her efforts, ASPCA training is presented to all newly-promoted police department captains, lieutenants and sergeants. In addition, the ASPCA has hosted two Executive Development Seminars at the ASPCA animal hospital for department personnel in the rank of captain and above. Deputy Inspector Kilfeather's continuing support of these crucial training efforts contributes greatly to the overall efficiency of the program. Sgt. Murphy brings a myriad of supervisory investigative experience to his role as Commanding Officer of the Animal Cruelty Investigation Squad (ACIS). Sgt. Murphy's previous assignments include Precinct Detective Unit Supervisor, Homicide Unit Supervisor, and HIDTA Supervisor. Under Sgt. Murphy's leadership, ACIS has had a significant impact on animal welfare in New York City. ACIS detectives have conducted several successful animal fighting cases and continually effect cruelty arrests as the result of investigating open complaints of animal cruelty. Sgt. Murphy has cultivated relationships with prosecutors at the local, state and federal levels and has conducted cases in all venues. In addition to enforcement, Sgt. Murphy ensures that ACIS personnel work closely with the ASPCA Community Engagement members on those cases where there is no criminality, but where there are opportunities to provide necessary resources to community residents in need. Sgt. Murphy has been a cornerstone of the program and a significant contributor to its success. Sgt. McGuigan is being recognized as an integral part of the war on animal cruelty in Bronx County. His tireless efforts to assist in improving the welfare of animals in the borough are admirable. Sgt. McGuigan has displayed dedication to helping fight animal cruelty at all times, including nights, weekends, holidays and vacations, when he always answers his phone and is willing to get involved. His knowledge of the Bronx and his network of colleagues in other Bronx commands ensures a quick response of needed personnel day or night. Sgt. Seymour is being recognized for his dedication and assistance to the NYPD/ASPCA Partnership. Sgt. Seymour supervises all liaisons in Patrol Borough Queens North Precincts, where he ensures that all animal complaints reported in PBQN are thoroughly investigated. He has also played a crucial role in growing the NYPD/ASPCA Partnership in Queens Precincts through providing animal cruelty related training to supervisors, police officers, and newly assigned members of PBQN, as well as implementing ongoing training to all precinct Sergeants to distribute to their own commands. Det. Glynn has played a significant part in numerous arrests made in animal cruelty cases, resulting in the rescue of hundreds of animals. This year alone, his tenacity led to the arrest of an individual responsible for the horrific act of stabbing a dog to death in Manhattan and subsequently throwing the deceased animal in the garbage. He has been involved in multiple long term animal fighting cases prosecuted by local and federal prosecutors, including cases that are currently ongoing. Det. Cadiz's dedication to animal welfare throughout New York has led to numerous arrests in animal cruelty cases and contributed to the rescue of hundreds of animals. In March of this year, he was part of a joint operation with the ASPCA, Animal Care Centers of NYC, the Queens County District Attorney's Office, and the DEA Strike Force that resulted in the arrest of two individuals from Bronx and Putnam counties. The individuals arrested were charged with drug possession and conspiracy for hiding ten kilos of cocaine in the false bottom of a dog crate under a Shepherd-type dog who was shipped from Puerto Rico to New York. The drugs had an estimated street value in excess of $1 million. As the 105th Precinct's Animal liaison, Det. Monzert is consistently dedicated to all animal-related issues whether on duty or off. She constantly assists her fellow officers, ASPCA liaisons and Community Engagement Coordinators with responding to animal welfare concerns that arise in her community. As a result of her tireless efforts, numerous investigations have been concluded that resulted in the removal of animal cruelty victims from unsafe situations. She continued to engage with animal welfare issues through her recent maternity leave and has recently returned to being an invaluable resource for the 105th precinct and the broader community. Det. Brant is the primary NYPD community liaison for approximately 48,000 residents living in 40 NYCHA developments spread over 281 buildings. He has served as the PSA 2 Community Affairs Officer for 17 years, and is being recognized for his continued efforts to bring needed resources to his Brooklyn community through the NYPD/ASPCA Partnership. He has engaged the public with the ASPCA mission through National Night Out events, Family Day events, and many additional police/community gatherings. These interactions have proven immensely valuable to community residents and their pets in need of assistance. Earlier this year, while conducting an unrelated investigation, Det. Edelman and Det. Kalman came across a horrendous act of animal cruelty. They observed a Facebook video of a perpetrator beating a cat named Chester. The detectives immediately began searching for Chester and found him dumped in the garbage. Had they not acted so quickly, Chester likely would have died, and possibly never been found at all. Det. Edelman also followed through with the investigation, obtaining a statement from the defendant that ultimately led to his arrest. Officer Rochester is a Neighborhood Coordinating Officer in the 67th Precinct and is being recognized for his strong collaboration with the ASPCA's Community Engagement team through investigations of animal cruelty complaints in the command. In one instance this year, Officer Rochester's commitment to the NYPD/ASPCA Partnership and his communications skills led to warm and clean shelter, medical care, and spay/neuter services for three dogs in need in his community. Office Venuto was appointed as the ASPCA liaison for the 9th Precinct in 2015, and she currently oversees all animal-related incidents, providing outreach assistance as needed. Since her appointment, she has made multiple arrests in cases of animal abuse and neglect, and she regularly partners with Community Engagement coordinators in cases regarding dogs who belong to homeless individuals and are in need of medical treatment. Officer Venuto's dedication to the animal welfare cause has also extended to the rescue and successful placement of dozens of dogs. Office Biondolillo has been the 23rd Precinct's animal liaison since the inception of the NYPD/ASPCA Partnership in 2014. Officer Biondolillo has assisted on numerous animal abuse cases within the 23rd Precinct as well as outside the confines of her command. She is being recognized for her tremendous dedication and tireless support to the animals and people she serves. Officer Klyde is the eyes and ears of the animal welfare mission in Bronx County. Her dedication and commitment have made her a valuable asset to the NYPD/ASPCA partnership. Through her work, she has partnered with ASPCA and PBBX personnel on dog and cat cases spanning the entire borough. ADA Turner is being recognized for her dedication and expertise in overseeing all of the animal abuse cases in Kings County. In 2016, the Kings County District Attorney's Office selected ADA Turner – a veteran prosecutor who has been with the Kings County DA's Office since 1999 – to lead the Office's new Animal Cruelty Unit. Since her appointment as Chief of the Animal Crimes Unit, ADA Turner has worked hand in hand with the NYPD and the ASPCA to review, investigate, and ensure the successful prosecution of all animal-related crimes in the county. Her commitment to these cases has been invaluable to protecting the animals of Kings County. For more information about the NYPD/ASPCA partnership, visit https://www.aspca.org/animal-protection/nypd-partnership.